Seven people died of suspected overdoses in Vancouver during the week of Sept. 10th. The deaths came after Coastal Health issued a warning that Carfentanil had been detected in the local drug supply. Toxicology reports aren’t complete. 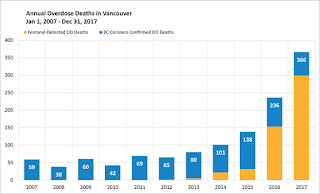 265 people have died of an overdose in Vancouver in 2018, on par with 2017.